I haven’t written about music in a while, and seeing as how music was my original raison d’être for this blog, I thought I’d talk about some new music. That is, I’d really, really like to do that, but I haven’t really acquired anything new. In fact I’ve been so out of touch with music lately I didn’t even know Rise Against had a new album (Appeal to Reason). I haven’t given it a listen, or bought it, but I did enter a contest to win it. Not holding out hope, so probably I will pick it up before December. I hope. Other than that, I think I’m going to have to go attack a free music resource somewhere and just see if I can find anything I like, and just report on it. I think that way I can also listen to some independent stuff that probably swims below my music surface on a more regular basis. I should point out that sometimes, for me, “tonight” might mean “tomorrow” as I can get pretty busy sometimes. I’m posting this from work and I shouldn’t even be doing that. I digress. This album is fantastic! I wish I had heard of it before – apparently it was only released in April 2007. I will admit that my only thorough experience with The Offspring is their album “Smash” (amazon.ca), but I do recognize most of the stuff on this album. For some reason, iTunes put the album out of play order on my ipod, so I’m effectively listening to it in random/shuffle (whatever they want to call it). That’s okay, because I’m finding it doesn’t really affect my listening pleasure. It’s standard bluegrass when you get down to it, and its ridiculousness is matched only by Paul Anka’s “Rock Swings” (amazon.ca), and “The String Quartet Tribute to the Offspring” (amazon.ca). While the cover art on the latter album makes it a tempting buy, I think I can safely pass on it. Speaking of the album art – I love it on Americano. Nice and bright, very colourful. I kept my ipod screen on (vs locked) just to look at it while it played. Bottom line: if you enjoy bluegrass and The Offspring this is the perfect marriage of the two. Even if you just like bluegrass you’ll probably enjoy it. It’s a really great out-of-genre cover. EDIT: I’m not sponsored by amazon.ca or anything, that just happened to be the site I used today. I haven’t made any progress with regards to the “Funkmobile” project – haven’t even started any work at all, actually. That’s alright – plenty of time for that one. Some new stuff I’ve heard though. Hawksley Workman came out with a new album last week. I bought it on itunes, and I was pretty damned pleased. It’s more of a rock/alternative album than “Between the Beautifuls”, which I guess explains why he’s got a second album out within a year of the last one. There’s an mp3 on the “Hero Hill” blog I want to listen to. I forget why, but it will determine, I suppose, if I want to hear more. Oh and I just remembered I need to get Red Jumpsuit Apparatus from Mike, and look into the latest Offspring album. Is it a coincidence that after listening to Rae Spoon’s “Come On Forest Fire Burn The Disco Down” on Radio 3’s podcast yesterday, I’m reading a review on it today on Hero Hill? It’s a pretty damn good song – and so were many of the tunes from R3’s Pride Podcast. I’ll have to get a list of the tracks later. I always love out-of-genre covers so I can’t wait to hear this one. 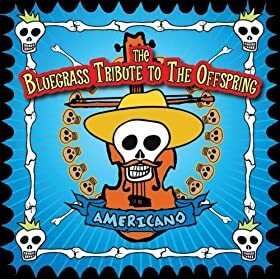 Add the fact that it’s The Offspring covered in Bluegrass and I think I found a winner. Will post later tonight what I think of it (hint: it’s great).